Would you say love is completely blind? Is it a feeling that's hard to find? Harley Quinn would say so. Especially when the Joker flips a peso. Deciding if he should pump or grind. Yeah! Grind. 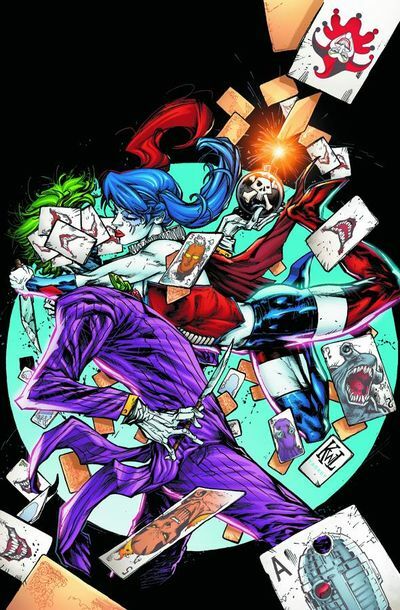 With the suicidal creative team of Writer: Adam Glass; Artist: Fernando Dagnino; and Publisher: DC Comics in January 2013. Now let's boogie! Whilst Amanda Waller and Yo-Yo spy on them from affair, can you guess what Harley Quinn and The Joker get up to in this second part of 'Running with the Devil'? No. They don't shag each others brains out in a pig-sty filled with cornflakes. Instead, they rip each other to pieces, whilst housed within a chemical plant that instigated both of their origins. Oh! Isn't that just lovely! Almost as lovely as a tortured victim having to prise themselves away from their beloveds prison. Sigh! 'Have you ever been in the presence of greatness? I'm not talking about a celebrity or an athlete. I'm talking about someone who changes the world. Someone who history will never forget. So have you? Well, I have, and I'll tell you something... it's to die for'. Well, not only is this passage very-well paced, but I did like the contrast between the visuals and what Harley was surmising. All in all there were three things I really did like about this adventure. Firstly, I liked the ending -- say no more. Secondly, I did enjoy the notion that 'Harleen' wasn't the first 'Harley' in the Jokers employ -- as it does give their dynamic a new spin. And thirdly, I loved the brutality of their fight together, as... errr... no. I'll leave that for the 'Innovative' section me thinks. Although I understood that the 'spying device' linked the 'Harley' part of the story to the 'Squad' part of the story, at the same time, why bother? It wasn't integral to the overall plot. If anything, this 'device' was just a casual way of linking two plots strands together. Nothing else. Now some of you might not have got the reference; but did you know that the act of biting someone's ear off is an Old Italian tradition, signifying a vendetta between two opposing parties? If you watch Al Pacino in 'The Godfather Part 3', the origins behind this brutal act is explained in some depth. OK, so now that I've said all that -- as well as alluded to this statement up above -- can you guess what I thought was the most innovative thing about this issue. Yes. That's correct. I liked it when Ivy bit the Jokers tongue. Ha! Vendetta!!!!! HARLEY: I'm still on the plant-themed casting-call track, dear reader, plus in the right frame of mind of casting the Ex-Miss-J, as an 'Aquilegia Red Hobbit'. Well, they do both look similar, don't they! AMANDA: For this b*tch, you'll need a plant that's pretty, hardy, fuzzy, and blends into the undergrowth. You're not thinking what I'm thinking, are you? A Conifer! There's only one movie in the known universe I can compare this story to. No. Not 'The Birdcage', silly. 'The Break Up'. All for pretty obvious reasons really, just distilled down an awful a lot. Now I didn't mind reading this issue of the 'Suicide Squad' one little bit. It was funny. Brutal. Intriguing. And had a nice concussion to it too -- with something I'd like to see more of next month. Yet, whilst saying that, there was a question plaguing my mind at the same time -- was this yarn integral to the current 'Death of the Family' story-line running in the Bat-books? No. No it wasn't, was it? I'm sure this 'Harley / Joker resolution' could have been played out at a later date. Moreover, the whole thing seemed as if it were wedged into something else that could have taken its place! Listen; I'm not trying to bad-mouth the creators or the editors behind this book. All I'm saying is that 'forced events' don't give us -- the fans -- hope for the future of comic books, if all we are to them is a way of making money. I prey this is not the case. All in all -- a nice issue.